The Boy Scout Hut at Second and Fleitas was one of Bill Kidd's personal projects; and that was to refurbish and redesign its interior to maximum utilization by the scouts. The current troop leadership and scouts have sprayed for termites, completed painting the inside walls, and have replaced window panes and the attic ladder. Summer at Camp Tiak was helped out by new staff volunteer, Maurice Marshall, who performed first aid administrations for minor abrasions and camped out with the boys. He summed up the five-week camping trip as heartwarming and hoped that new scouts and volunteers will participate in the next Camp Tiak event. Membership to Boy Scout Troop #316 is open to all boys aged 12-17 years. Those who are interested should meet at the Boy Scout Hut on Monday evenings between 6:30 to 8:00 p.m.
A special viewing of the new Scout Trailer was celebrated with Mayor Billy McDonald on Friday, August 28, 1998, at "The Hut." The meeting was conducted by troop advancement chairman C. Randall Jones. Bill Kidd, troop chairman, spoke briefly on the importance of knowing and living by the Scout Oath and Law. 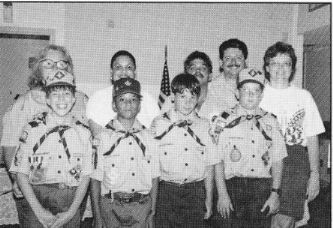 Twenty boy scouts, members of Pass Troop #316, were presented badges denoting advancement at a Court of Honor ceremony on Tuesday evening, February 2, 1997 at the Pass Christian Yacht Club. Sixteen of them were new tenderfoot scouts who moved up from Pack #316 and two young men, both patrol leaders, Paul Saucier and Clark Lizana, were awarded star scout badges. Many parents and siblings were in the audience. Gary MacKenzie, troop scoutmaster, presented the badges to the boys. Paula McKinion, cubmaster of Pack #316, from which the new tenderfoot scouts "graduated", expressed her pleasure of seeing her boys advance together in the troop. Both scouting units are sponsored by th~PassRotary Club. 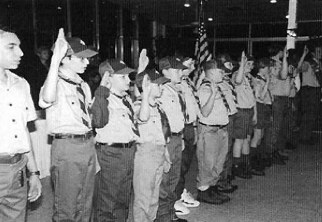 In..an impressive "bridging" ceremony, Webelos Cub Scouts of Pack 316 moved upward to Troop 316 before an audience of parents and Scout leaders on May 23rd, 1995, in the Hancock Bank Annex. Four of the youths, with their parent(s) standing behind them, left to right in the photo are Jeremy Chapman, Ronald Lizana, Cameron Fournier and Eric Mays (Dominic Crawford also "bridged" but could not be present for the ceremony). New neckerchiefs are symbols of their new troop association. The Cubmaster is Paula McKinion and the Scout-master was Fred Tagge. All scouting units are sponsored by the Pass Rotarv Club. Webelos is a conjunctive acronym for the highest Cub Scout level — having passed from being a Tenderfoot, through Wolf-Bear-Lions levels to WeBeLos. 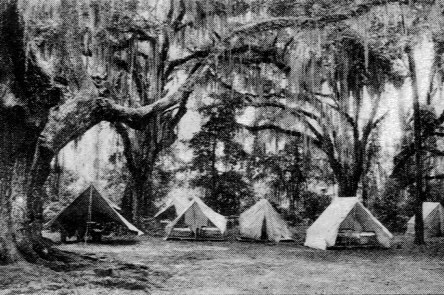 Frequented for many years by Boy Scouts from Louisiana and Mississippi was Camp Salmen as it lay beside Bayou Liberty near Lacombe outside of Slidell. The camp closed in 1983, having a large number of buildings that included a Commissary, Scoutmaster's lodge, and many cabins that housed four double bunks for scout overnight shelters. A new Tenderfoot was always sent out to look for the Church Key to turn off the artesian well at night fall. On May 2, 1971 the new City Hall was dedicated to the memory of the victims of Hurricane Camille. Representative Jim Simpson, Sr. introduced Lt. Governor Charles Sullivan after the Flag Raising ceremony performed by Boy Scouts James Stanboro, Roger Fitzgerald, Raymond Fitzgerald, Malcolm Jones and Jimmy Rafferty. Approximately 700 Pass residents attended with other guests including former Lt. Governor Bidwell Adam whose father E.J. Adam, Sr. was a former Mayor of the Pass.